Sterile compounding requires a robust contamination control program that encompasses personnel and material flow; staff gowning, training, and adherence to policies and procedures (P&Ps); compliant aseptic manipulation; and environmental monitoring. Proper cleaning and disinfection practices, in line with USP <800> requirements, are fundamental to maintaining contamination control in the compounding environment. The concept of a formal cleaning program was officially introduced in 2004 with the advent of USP <797>. Prior to these minimal practice standards, compounding locations typically addressed cleaning informally, oftentimes without standardized P&Ps in place. Due to varying state regulations, accreditation interpretations, and the risk of diversion, hospital pharmacy departments often do not permit environmental services to conduct pharmacy cleaning, preferring to assign these duties to pharmacy staff. However, even when pharmacy assumes cleaning duties, inconsistent and inadequate results due to lack of training and validation are not uncommon. Implementing a cleaning program compliant with FDA guidance and USP <797> and <800> principles forms the basis for safe hazardous drug (HD) compounding, protecting staff and patients alike. Under section 501(a)(2)(A) of the Federal Food, Drug, and Cosmetic Act (2116 U.S.C. 351(a)(2)(A)), a drug is deemed to be adulterated: if it has been prepared, packed, or held under insanitary conditions whereby it may have been contaminated with filth, or whereby it may have been rendered injurious to health. The FDA guidance is applicable to both sterile and non-sterile drug production. Although FDA guidance documents are not enforceable, they provide important information to guide practice and protect the public. The FDA states: Drugs (including biological products) prepared, packed, or held under insanitary conditions are deemed to be adulterated, regardless of whether the drugs qualify for exemptions set forth in sections 503A or 503B of the FD&C Act1; this applies to hospital and alternate care locations. 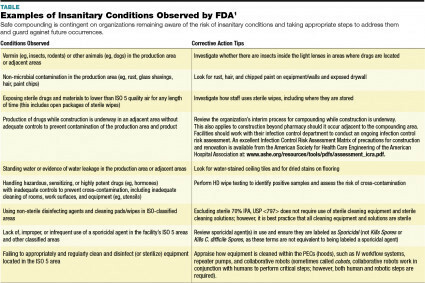 The unfortunate impetus for publishing this guidance was the insanitary conditions that FDA has observed while inspecting compounding locations, including those in hospitals, 503A pharmacies, 503B compounding manufacturers, and pharmaceutical plants (see TABLE: Examples of Insanitary Conditions Observed by FDA). 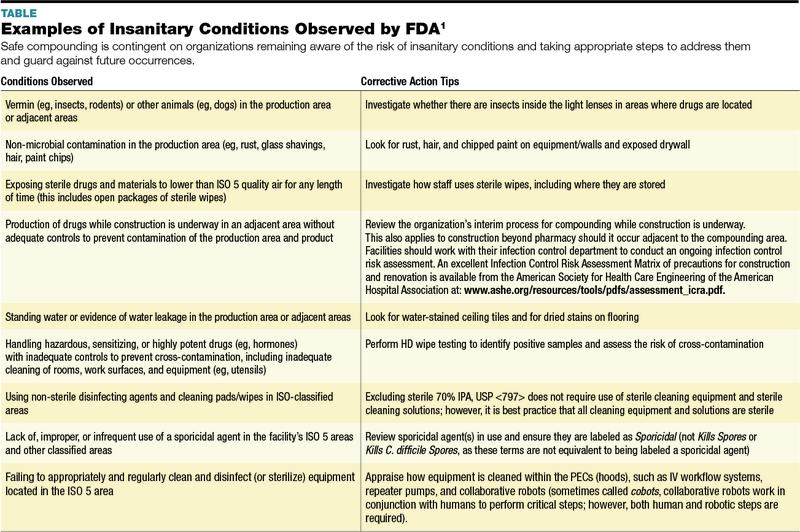 Sites should use the FDA guidance document as a routine inspection template to validate safe practice. When insanitary conditions are identified, organizations should implement corrective actions immediately. Historically, sites compounding medications have used 70% isopropyl alcohol (IPA) as a cleaning agent. However, IPA is not a cleaning agent; it is a disinfectant and does not meet the definitions listed within the noted USP standards of a cleaning agent.5 The use of IPA as a misunderstood surrogate cleaning agent in non-cGMP compounding locations has been employed without a validation process to support the effectiveness of the agent. As noted, a correctly defined cleaning agent must remove dirt, debris, microbes, and drug residues. The lack of IPA’s cleaning ability is most evident with HD compounding. Although IPA is commonly used, it is important to understand that IPA does not remove residue or break down, so IPA residues linger. For more than 30 years, studies have identified HD residue in measurable concentrations in the environments where they are handled. These residues can also be tracked throughout the line of handling—from the receipt of the drug at the loading dock, to compounding, administration, and disposal.6 The objectives of a USP <800> cleaning program include protecting patients, health care workers throughout the continuum of HD handling, and the environment (see FIGURE). Cleaning practices should not be developed in a vacuum; rather, consider the totality of FDA guidance and USP requirements. In order for sites to be compliant with USP <800> cleaning practices, they must also be compliant with the requirements set forth in USP <795> for non-sterile preparations and USP <797> for sterile preparations. USP <800> highlights the importance of cleaning by devoting an entire section to it: Section 15 outlines the four-step process of deactivating, decontaminating, cleaning, and disinfecting, noting that not one single method or cleaning process exists as a universal standard for all HDs. USP <800> provides comprehensive definitions of each of these steps, as well as the reasoning behind each. The goal is to provide a suitable environment that protects personnel and patients by removing HD residue and returning the cleaned location to baseline (ie, no residue or contamination). Deactivation is intended to render any HD surface contamination inert or inactive. It is important to recognize that in terms of deactivation, there is no single, proven method for inactivating all compounds. EPA-registered oxidizing agents (eg, peroxide formulations, sodium hypochlorite, etc) represent the most widely used option and should be used when possible. However, note that these agents are caustic; products such as sodium hypochlorite will pit or mar stainless steel surfaces if left in contact for too long. Decontamination focuses on inactivating, neutralizing, and physically removing surface contamination/HD residue with a deactivation agent and transferring it to sterile, lint-free, absorbent, disposable materials. Chemicals such as sodium thiosulfate can help neutralize chemicals used in the deactivation step to minimize corrosion and pitting of stainless steel. In addition to enhancing the cleaning process, decontamination should be strongly considered for each drug vial that may arrive from the manufacturer already contaminated. Applying this step to vials can reduce contamination introduced into sterile compounding primary engineering controls (ie, hoods). Note that it is important to ensure that the solvent used for wiping vials does not alter the product label. Cleaning focuses on removing contaminants from surfaces using water, detergents, surfactants, and solvents or other chemicals. The cleaning section in Chapter <797> is appropriate for both hazardous and nonhazardous drugs. It is critical to ensure that any products used for cleaning do not introduce microbial contamination. Facilities should examine all product material specifications to ensure products chosen are EPA-registered to meet the five “-cidal” criteria: bactericidal, fungicidal, virucidal, tuberculocidal, and sporicidal. Remember that if an agent states that it “kills spores” or that it kills a specific type of spore, this is not equivalent to being labeled a sporicidal agent. If a product in use is not clearly labeled as sporicidal, a sporicidal-labeled agent should be added to the cleaning regimen. Another important consideration for choosing cleaning agents is the required contact time of an agent with a surface to induce the specific -cidal response. Some agents require up to 5 minutes of direct contact time to be effective; the agent should be applied in the defined quantity and allowed to remain on the surface for the stated time. Wiping away the agent too soon eliminates the cleaning benefits and may allow microbes to proliferate. Disinfection is intended to inhibit or destroy microorganisms and must occur in areas that are required to be sterile. EPA-registered disinfectants and/or sterile 70% IPA are appropriate agents for this step. The use of ultraviolet light as a means for disinfection should only be considered as an adjuvant to physically applying and removing liquid disinfecting solutions. Any biofilm that might remain on surfaces can be removed with the physical wiping motion. The four USP <800> cleaning steps must be employed in all locations where HDs are handled. For example, non-sterile areas where HDs are handled (eg, receiving containment ventilated enclosures [CVE]) and reusable equipment and devices (eg, counting trays, spatulas, unit dose devices) must be deactivated, decontaminated, and cleaned. As directed by USP <797>, sterile preparation areas also must include the final step of disinfecting. Selected cleaning solutions must not be reactive to surfaces to be cleaned and must not harm equipment or impact the protective nature of devices employed (eg, melting surfaces, pitting stainless steel, melting casings of electrical wires, penetrating gloves, and impacting the HEPA filter seals in primary engineering controls). www.fda.gov/ICECI/Inspections/InspectionGuides/ucm074922.htm).7 Either sterile water or 70% sterile IPA are effective at removing residue. Protecting health care workers, patients, and the environment from HD exposure, as required by USP <800>, is the goal of a robust cleaning program. Achieving compliance with USP <800> requires a comprehensive approach to deactivation, decontamination, cleaning, and disinfection, based on FDA guidance and USP <795> and <797> principles. As the date for USP <800> compliance is less than a year away, organizations should investigate their cleaning practices now to ensure any required adjustments are made forthwith. United States Department of Health and Human Services, Food and Drug Administration Center for Drug Evaluation and Research, Office of Compliance. Compounding and Related Documents, Revision 1: Insanitary Conditions at Compounding Facilities Guidance for Industry (Draft Guidance, September 2018). https://www.fda.gov/downloads/drugs/guidancecomplianceregulatoryinformation/guidances/ucm514666.pdf. Accessed November 27, 2018. USP General Chapter USP <795> Pharmaceutical Compounding – Non-Sterile Preparations (Proposed Revision). http://www.usp.org/compounding/general-chapter-795. Accessed November 27, 2018. USP General Chapter USP <797> Pharmaceutical Compounding – Sterile Preparations (Proposed Revision). https://www.usp.org/compounding/general-chapter-797. Accessed November 27, 2018. USP General Chapter USP <800> Hazardous Drugs—Handling in Healthcare Settings (Proposed). http://www.usp.org/compounding/general-chapter-hazardous-drugs-handling-healthcare. Accessed November 27, 2018. United States Health and Human Services, Centers for Disease Control. Guideline for Disinfection and Sterilization in Healthcare Facilities (2008). https://www.cdc.gov/infectioncontrol/guidelines/disinfection/disinfection-methods/chemical.html Accessed November 27, 2018. Sessink PJ, Anzion RB, Van den Broek PH, et al. Detection of contamination with antineoplastic agents in a hospital pharmacy department. Pharm Weekbl (Sci). 1992;14(1):16-22. United States Department of Health and Human Services, Food and Drug Administration Center for Drug Evaluation and Research, Office of Compliance. Compounding and Related Documents. Guide to Inspections Validation of Cleaning Processes. https://www.fda.gov/ICECI/Inspections/InspectionGuides/ucm074922.htm. Accessed November 27, 2018.